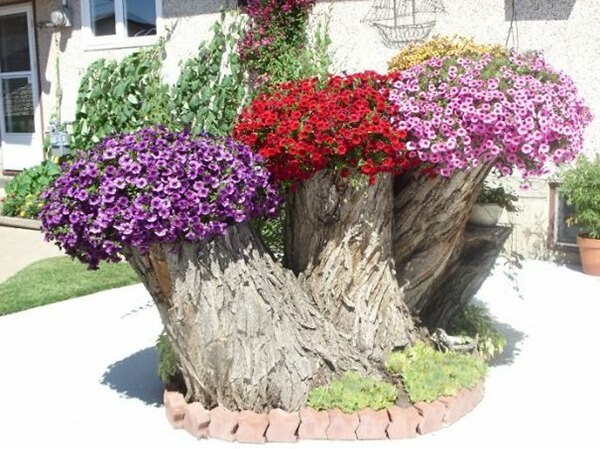 Check out this short video of making a tree stump into a lovely planter in your yard. After all, at one time or another, you are likely to have a tree stump on your property. They are difficult to remove and the author challenged you to use it instead to make a statement in your lawn for a shrub or a planter. The needed tools are few, which is helpful. You just need an axe, a wood chisel, a hammer, a drill, gloves and glasses for safety in order to follow all the steps in this tutorial to make a new garden icon in your landscape. When you choose what you want to plant in your tree stump, you will find you can have quite the variety of choices in your selection. Whatever you want to plant, you will want to consider first what size your tree stump container is, and if it will accommodate your plant of choice well. Small and thin stumps are better for small flowers or just one plant. A bigger stump can provide a place for a sapling or bigger shrubs. Sit back and look at your tree stump, the placement and your overall design dreams for the area. Allow your creativity to flow as you consider how to refurbish this old stump. Colors can be planned that accent other areas, or provide a focal point for the landscape. It is also possible to carve the outside of the stump to add character, add lights to show off your creation, or even to make a recycling statement. Where once stood an eyesore and reminder of a dead tree, soon can harbor new life and a bounty of color and visual appeal.